Sherbrooke has seen a rebound in single-detached housing starts in recent months. Lower supply on the resale market and a favourable job market have stimulated demand for new homes. In 2016, employment in Sherbrooke continued to grow, and the year ended with net gains in full-time jobs among people aged 25-44. These factors should support housing demand in 2017. In Toronto, low supply in the resale market resulted in demand spilling over into the new home market, particularly for low rise homes. Single-detached home starts were at their highest level for February in more than ten years. The total housing starts trend remained steady in February despite a drop in apartment starts. 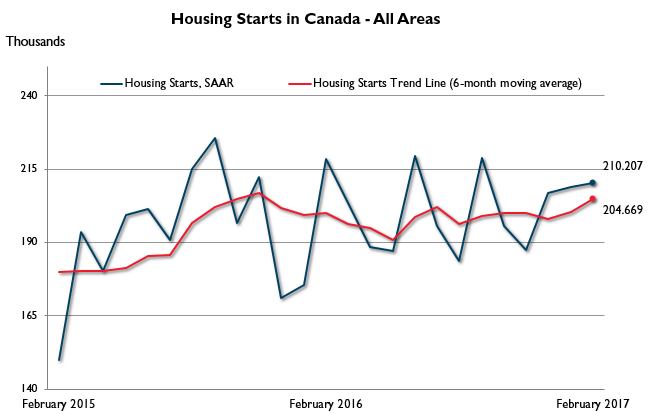 February saw total housing starts more than double in Winnipeg compared to the same period last year. New construction of multi-family units continued to drive total starts higher, with both purpose built rental and condominium units increasing year-over-year. Single-detached starts were also up by roughly 30% reflecting low inventories of completed and unsold new homes in 2016. Data for 2016 based on 2011 Census Definitions.